Nivaldo Batista Lima, better known by stage name Gusttavo Lima is a Brazilian singer/songwriter and instrumentalist Brazilian country music. Owner of a musical talent evaluated as "inconsistent", Lima became nationally known with the popularity of the song "Ballad Good", which define himself negatively, and even refused to record it first, but eventually became a hit, reaching the Top 10 of Billboard Brazil, and rendering comparisons with singer Luan Santana. The album Gusttavo Lima and You, has sold over 50,000 copies and received a platinum disc. In 2011 was the third person of the most accessed Google Brazil ahead of singers like Luan Santana and Michel Telo. The cache Gusttavo is around 150 000 per show and next to Jorge & Mateus, Luan Santana, Paula Fernandes Telo and Michel were the largest caches of the country. Son of Alcino and Sebastiana Lima, although born in Minas Gerais, grew up in Goiânia, Goiás. In 1998 while he was just 9, he joined as soloist in a choir and gained attention through his interpretation of "É o Amor", composed by Zezé di Camargo & Luciano. Gusttavo cited as some of his main inspirations Gino & Geno, Chitãozinho & Xororó, Bruno & Marrone and Zeze di Camargo. In 2009, Gusttavo released his first independent studio album called Revelação. In 2010, he signed with Som Livre label and released Inventor dos Amores, as a CD and DVD, with sales of 15,000 copies. The title track was a collaboration with Jorge & Mateus, reaching #24 in the Brazilian Billboard Brasil charts. Based on this initial success, he released the single "Cor de Ouro" that reached #21 in Brazil. 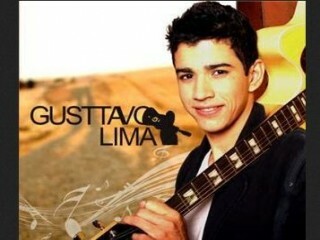 In 2011, Gusttavo released CD and DVD titled Gusttavo Lima e Você which was recorded live in Patos de Minas, on June 3, 2011 during Fenamilho musical event with estimated audience of 60,000 people. The highly popular album reached #7 and was certified platinum. The album produced his definitive hit "Balada" (full title "Balada Boa (Tchê Tcherere Tchê Tchê) based on the famous refrain), which reached #3 in Brazil. The Brazilian football player Neymar played a similar role to that he played in Michel Teló's smash success "Ai se eu te pego!" and appeared in many shows with Gusttavo Lima. Gusttavo is also releasing his hit single "Balada" in European music markets. View the full website biography of Gusttavo Lima.